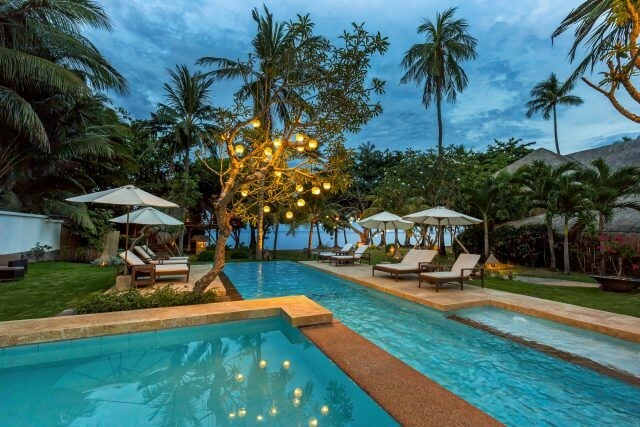 The Atmosphere Resort and Spa is nestled on a coconut plantation near Dumaguete, in the Philippines. Indeed, the resort is located on the Negros Oriental island and is surrounded by lush greens and some of the Philippine’s best scuba diving sites. 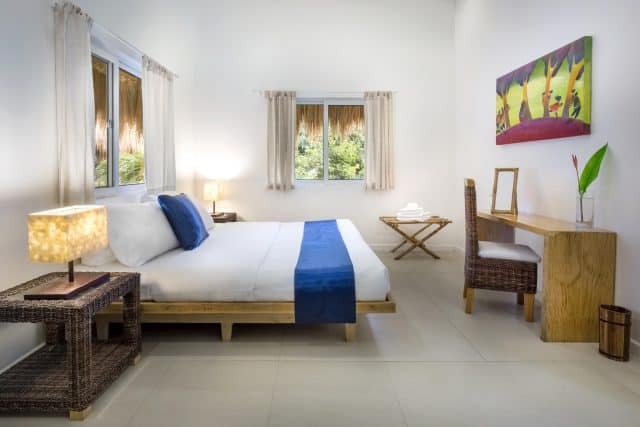 The resort is affiliated to PADI in terms of diving, and offers luxurious accommodations to the divers or travelers. The resort can welcome a maximum of 90 guest at once, spread on the resort’s ground that count for 7 acres (nearly 3 hectares). The rooms choice goes from deluxe rooms to penthouses and is all about luxury and environmentally friendly features. 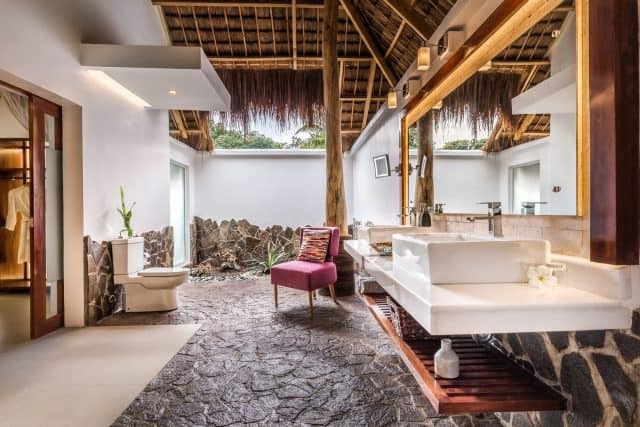 Indeed, every room comes with a private ensuite bathroom, eco-friendly toiletries, solar heated water, and eco-energetic air-conditioning. Plus, all the rooms benefit from a coffee and snack corner, wireless internet and a complete audio-video system. Garden Apartment – California king plus extra single bed possible – Apartment amenities. The Atmosphere Resort and Spa has a sea-side restaurant, a pool-side bakery and a bar. Plus, the options are varied and oriented towards a healthy lifestyle. Moreover, as the resort’s name states, you will find a spa with a varied card of treatment at the Atmosphere resort. Also, there’s a complete fitness center at your disposal, including a full gym, a yoga platform and specialized training such as TRX. Scuba diving in the Philippines is most likely to be exquisite regardless of where you’re at. In fact, with the Atmosphere Resort being located near Dumaguete, you have access to renowned scuba diving destinations such as the Apo Island. Plus, this means a direct access to many sites where you’ll find rare critters. The area around Dumaguete is well-known and sought-for among underwater photographers and critter spotters! 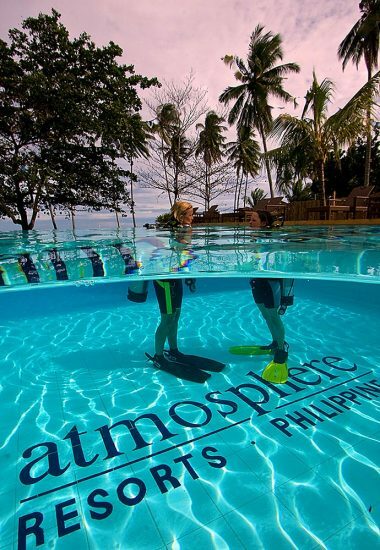 The facilities at Atmosphere Resort in the Philippines are oriented towards an active lifestyle, and this extends to scuba diving. Indeed, the resort proposes a full PADI dive center, with a whole range of courses available. 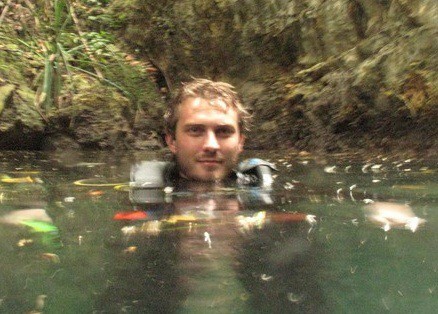 Plus, in terms of diving, you can experience it either from shore from a boat. The variety of sites nearby such as reefs, wrecks, walls, night dives, etc. will leave you with plenty of choices. Price starts at 250$US for a Deluxe room. If you have been staying at this dive resort in Philippines, please share your review and let us know what you thought. Please post your comments in the review section below, by doing so you will help fellow divers to plan their next diving trip . The Atmosphere Resort is right for the diver that wants a great training and access to the most beautiful diving sites in the Philippines along with luxurious accommodation.